We'd like someone to play taps now. IKEA has announced that they're discontinuing their venerable Expedit line of shelves, which have been a mainstay of the board game and RPG scene for years now. The shelves, with ample space to hold nearly any bulky board game box or full-size RPG hardcover, are pretty fantastically useful. 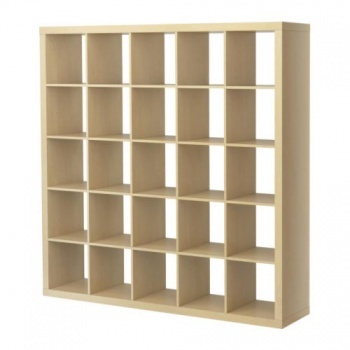 IKEA is already pimping what they're calling the Expedit's replacement, the Kallax, but there's a certain fear that the thinner Kallax won't be able to manage the hundreds of pounds of thick RPG books that the sturdy Expedit could. While the shelf is, for now, only discontinued in Germany, IKEA maintains a global distribution system that encourages verisimilitude of a single global inventory. It'll only be a matter of time before the shelves are phased out in the rest of the world. Also panicking, apparently: Vinyl record collectors. A German language Facebook group has been set up to decry the loss of Expedit and save it, accruing an unsurprising 20,000 likes given the country's love of both board games and vinyl. The Facebook protest is founded, apparently, on the notion that the Kallax replacement shelves won't have a 5x5 configuration. A reasonable concern for collectors with particularly dense collections who want a compatible look with their existing shelves. Now, if you'll excuse me, I'm going to go buy all the Expedit I can fit in my car and pour one out, in that order.